Become famous with myDaVinci's In-Masterpiece series of artworks. Let your little boy shine on the war horse in this masterpiece for a cool wall decoration! He'll love to see him looking like a little hero. 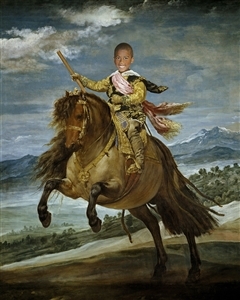 Based on his photo, our talented graphic artists will seamlessly place his cute face into this vintage oil painting entitled "Prince Baltasar Carlos on Horseback", originally created by Diego Velazquez during 1635-1936. Great gift for my grandson. Great to have options for people of all colors!